Rain again, as soon as I was awake, it sometimes feel like it waits for me to have to pack up and then it pours down. It was short though and it did not trouble me too much. 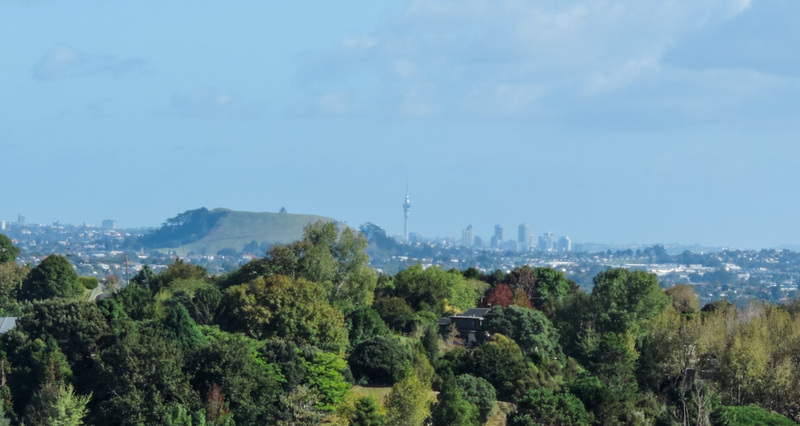 As I was packing up I felt somehow different from the other days, strange as it might seem, not being Auckland in any way my home, I felt almost like I was going home. The plan for the day was to ride the 27 miles to the town centre and meet Adam for lunch and then get the ferry and ride the last 10 miles to Browns Bay. The route was less than exciting, taking me trough the south shore and then into the residential bits at the south east of the city. First thing first though, I needed money and I needed food. I got into Beachlands, that I discovered to be a rather smaller place than I thought the night before. Fortunately there was an ATM and a bakery and in the end I ended up having a rather large slice of pizza to fuel my ride into Auckland. 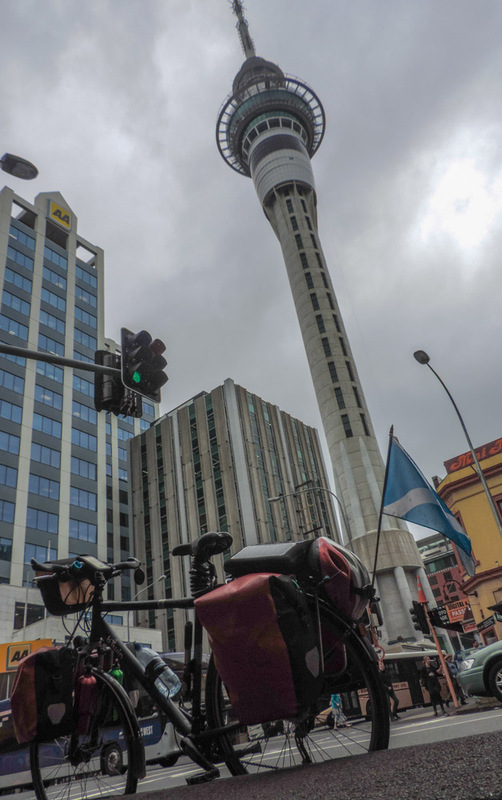 It was a bit of a detour but it was needed and it left me with Google telling me I would have been in Auckland 10 minutes after the time I’d arranged to meet Adam at. It was all day navigation using the Sky Tower as a destination point, visible from Beachnlands and in increasing size from many point on route, this landmark has an almost inexplicable fascination in my mind, every time I see it I feel like I have to take pictures of it. 7 miles to go to downtown, now the tower is getting bigger. A few more hills and I had made up the time I needed, I was now going at Google speed but I was also getting into town and there is where the navigation becomes a bit more complicated. I try to be good and not do mobile phone handling while riding the bike but, sometimes, it is just not possible and the chance of getting lost and loosing time was not appealing today. Google took me on a good route, no major hills and not a huge amount of traffic. That really surprised me as I had read that Auckland has more congestion than New York and Paris. In the end I got downtown with 10 minutes to spare and had a lovely sushi lunch with Adam which included a quick catch-up on my and his last 10 weeks. Here I am making acrobatics to take the picture. At 13:05 he went back to work and I managed to get to the ferry terminal to make the 13:30 crossing to Devonport. 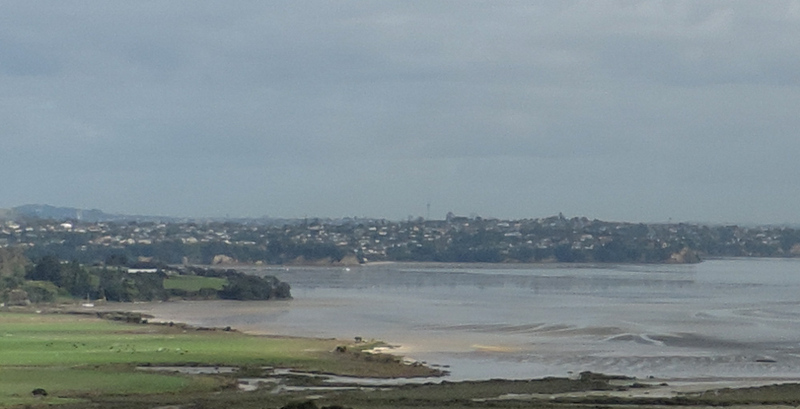 The weather was a bit unstable and in fact I caught a couple of showers between Devonport and Browns Bay, but I managed to dry up and got there in less than an hour. Arantxa and the girls were at home, no school now, and it was lovely to see them all. Adam got home later, just in time to go to the auction of a property they were interested in. Unfortunately this was not the one, the prices in Auckland are almost spiralling out of control, mostly fuelled by large amount of Chinese money coming into the country, but I’m sure the tide will turn and they’ll be able to find a property to call a home soon enough. We came home and Arantxa and I drowned the sorrow with my new poison of choice and stayed up talking for a couple of hours, it’s a work night and I was riding so we did not stay up that late, but it does not matter, I’ll be here till Sunday so we’ll have plenty of time to catch up on all the rest. Are you in Devonport? Look out for Judys place – shes our friend and we stay with her all of trips into NZ and Auckland. She owns the Peace and Plenty. Not too far I’m in Browns Bay staying with friends, I’ll have a look.